Considering the limited space in my small shop, I wanted to hang my clamps above the cement foundation and not block the parking of my major tools. To avoid the build-up of sawdust in the cleat I tapered the tops on a 45 degree angle as well.. Any spaces that are left over between the hanging blocks, are filled with the double 45 spacers. Once the hangers were in the correct position, I measured and added the fillers to the cavities. This setup allows me to add more pipe clamps later and move the bar clamps to a lower cleat. I added the stop blocks since the wall shakes when the back door is slammed….thinking of the Grandkids! Well done. Your clamp wall design is so much more elegant than commercially produced solutions. Thank you….I plan on using the same concept for my drills as well. Great job, I had to go vertical with my clamp storage as well…couldn’t afford the floor space for anything else. You did a fine job on organizing all of these nice clamps. Nice work! Thanks guys….a work in progress with the new shop. Nice job on the rolling cart Roger…but please make sure there aren’t any wood chips on the floor when you move it. I am re organizing my shop at the moment. 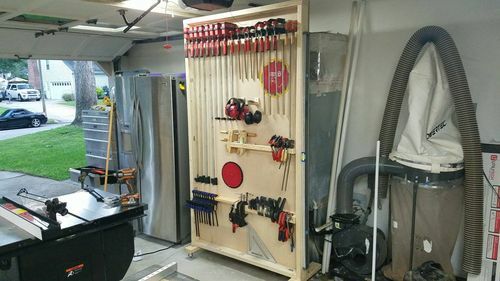 I need to find clever solutions to the space I have available in my small basement shop. I have considered storing my clamps like this as well. You did a good job, small shops are nice like that, forcing us to stay creative.